This list of Pilgrimage Site are the Verso Ministries Top Pilgrimage Sites in Region 13. The Regions that will be used for all of our lists are based off of the Regions used by the National Federation for Catholic Youth Ministry (NFCYM) and used for the Bishop Conferences. These resources are here for Youth Groups, Young Adults, and Individuals to be able to find local sites to go on Pilgrimage to. The Mother Cabrini Shrine in Golden, Colorado is a site that was originally founded by Saint Mother Frances Xavier Cabrini as a summer camp for her orphanage in Denver. Mother Cabrini is honored today for her missionary service to the poor, especially Italian immigrants, all across the United States. She helped found 67 institutions across the country, mostly hospitals and orphanages, and her life of service highlighted her Saintly nature. The Shrine hosts a museum dedicated to the great Saint’s life, a prayer garden, the beautiful Chapel, and the Lourdes Grotto. This Shrine is a perfect pilgrimage spot for any Catholic to honor one of the most important Saints to our country. She has interceded many times on behalf of people who pray to her and the novena for her intercession has been known to help with the discernment of young adults across the country. So go and visit one of the homes of this beloved Saint, roam the ground she walked, and glorify God through your journey that leads you to the Mother Cabrini Shrine. 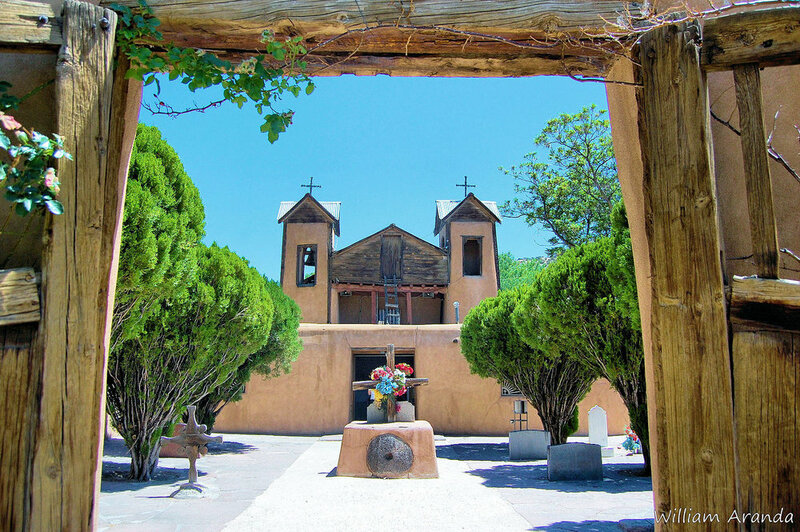 The Shrine of Santo Nino de Achoa began as a chapel built in 1856 and then refurbished in 1992 when bought by the Archdiocese of Santa Fe. The larger Santuario de Chimayo which hosts the Shrine was built in 1813 a the local Church for the area, which is still its purpose today. El Santuario is host to beautiful artwork throughout the small Church. Different mini-shrines host images of Saints, each of which has their own story to tell. This Church and accompanying Shrine are very much a work of the people who call them their home, a fact that is very apparent in every detail you see. All that is in there was provided by the generosity of the people of God and the works of art, if not created by the actual parishioners, were donated by them. For the pilgrim, this Shrine is a great reminder of the beauty and simplicity that live together in our faith. Visiting el Santo Nino is a powerful experience as there it has been a sign of God’s grace for many who have visited it in the past. So take time and visit this Church and Shrine in New Mexico and open your heart to what is being said to you while there. The Shrine of the Stations of the Cross in San Luis, Colorado was dedicated in 1990 as a home for the devotion in Colorado. San Luis is the oldest town in all of Colorado and the Shrine is built up on the Mesa at the center of town. The Stations themselves are all bronze sculptures depicting the trail the Lord took to his death on the Cross, all of this leading up to the Chapel of All Saints. This trail along the despairing journey of death ends with the hope of eternal life as seen in the Saints and brings about a great theological and spiritual journey for any pilgrim that embarks upon this trip. There is also a Grotto for Our Lady of Guadalupe that also has a statue of Juan Diego, honoring one of the most beloved Marian apparitions for the Americas. And so this site provides the great opportunity for all Catholics to make a pilgrimage to remember the Lord’s suffering and passion while traveling along a half mile trail with Him as the climb to Calvary is shared by the pilgrims and Christ. I encourage all pilgrims to take the chance to visit this Shrine if they ever get the chance to experience such a beautiful manner of living out the Stations in this vivid fashion, it will be spiritually edifying. The Shrine of Saint Joseph in Yarnell, Arizona is another Shrine devoted to the Stations of the Cross. In 1939, a group of Catholics commissioned a Native American artist to create the Stations throughout the land they owned in order to create a walkable and near life-sized set of Stations to bring about a deeper meditation upon the mysteries involved with it. At the start of the Stations is a bonus 15th Station with Christ celebrating the Last Supper while at the end is a Chapel for pilgrims to close their experience with these Stations in prayer and meditation. I would also encourage pilgrims who travel here to take special time at the statue of Saint Joseph, the patron of the Shrine, praying for his intercession in your life. There is a lot to do at this Shrine, and a fairly full day can be made of this beautiful piece of land in Yarnell. So take a group during Lent and pray the Stations of the Cross together while experiencing the lifelike nature of the statues that draw you closer to walking that path of the Cross with Christ. The Shrine of Our Lady of the Sierras was built in the late 1990’s in the fulfillment of the vision of a retiring couple who wanted to build a Shrine in honor of the Blessed Mother. What was originally meant to just be a large Cross built upon their property suddenly became a Cross, a statue of Mary, the Stations of the Cross, and a Chapel! This is a very spiritual site in which many have reported great spiritual experiences, and although we do not promise that anyone who make a pilgrimage here will have such an experience, it is true that many who go to this Shrine do so in hopes of a deep encounter with the Lord. So I encourage anybody who lives in Arizona and has a deep spiritual yearning to encounter the Lord to give this site a chance, who knows how He might speak to you here.